This is a partial preview. Full document is 51 slides. View large preview. 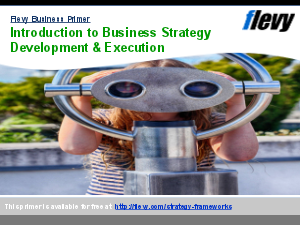 Summary: This document provides a framework to design your business strategy. A key question that every business needs to able to answer is "What is our strategy?" 'Strategy' is part of everyday business language and is often used in the wrong context (e.g. 'Operational Excellence' is not strategy). The core of any strategy is about making choices of where to play and how to win, supplemented with a 'why' (the mission) and the 'how' (doing it). There are typically 12 elements in business strategy formulation and this powerpoint provides a powerful and effective strategy framework for any business to check the health of each element to give a good audit of the business strategy. Strategy Development? Consulting Frameworks? Channel Distribution Strategy Example? Or something else.